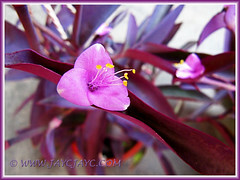 Absolutely value for money… it cost us just RM10 for a pot of Tradescantia pallida last June! We couldn’t be happier since seeing its steady and luscious growth. This attractive cultivar ‘Purple Heart’, with its fine-textured foliage in rich and deep purple hues provides an engaging sparkle amidst the greenery in our tropical garden. Undoubtedly, the Purple Queen as commonly named, deserves to be enthroned in a hanging basket to show off its succulent, long and leafy stems that cascade down so beautifully. It is another love-at-first-sight plant that had me seduced effortlessly. Simply irresistible! I was instantly mesmerized by its fabulous deep purple-coloured foliage and the tiny pink flowers that peeped out from the overlapping and curving bracts at stem tips. Thank goodness our visit to the garden nursery that day was in the morning and we got to see the attractive blooms which typically will disappear by early afternoon. 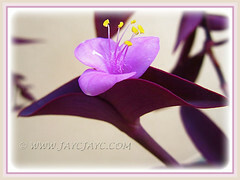 The good news is, being fuss-free and easy to grow, Tradescantia pallidathis blooms almost endlessly. Though the pretty pink flowers are seen only in the morning, they never fail to reappear the next day, and the next and next! Hmm… so rewarding! The pink flowers may be small, but they are an attractive bonus to this extraordinary purple beauty that is primarily grown for its striking and colourful foliage. Truly a unique purple-coloured, landscape plant to play with! It’s hardy and versatile, can be used for maximum dramatic effects in hanging pots, wall-decor plantings and raised planters or front-of-border groundcovers, rock gardens, etc. 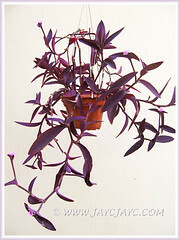 Common Name: Purple Queen, Purple Heart, Purple Secretia, Wandering Jew. Etymology: The genus name, Tradescantia was assigned to honour John Tradescant (1570-1638) and his son, John Tradescant the Younger (1608-1662) who were botanists and successive gardeners to Charles I of England. The species epithet pallida means pale or pallid, probably referring to its pale-coloured flowers. Origin: Native to Mexico, from Tamaulipas, Veracruz to Yucatan. Plant type: An ornamental herbaceous succulent. Features: Tradescantia pallida is an attractive species of the genus, Tradescantia that consists of an estimated 71 species of perennial plants. An evergreen perennial that grows up to 0.3 m (1 ft) in height and spreads vigorously to 1 m (3.3 ft) wide on ground or cascade down with its trailing stems in hanging baskets. 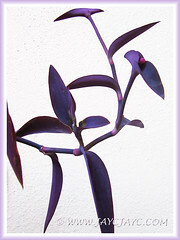 The long-jointed succulent stems are somewhat fragile and break off easily. 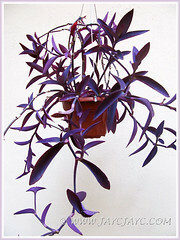 The popularly grown cultivar, ‘Purpurea’ (aka ‘Purple Heart’) produces deep purple fleshy stems and dark royal purple foliage, with leaves that are sheathed to the stems. Leaves are pointed, narrow and elongated (2.5 cm wide x 7.6-12.7 cm long) and arranged alternately along the stems. They are covered with a thin layer of fine hair. Pretty, 1.3-2 cm wide, pink to rose-purple flowers are produced where two curving bracts (modified leaves) overlap at the tip of the stems, making a stunning contrast to the dark purple foliage. Flowers can appear singly or in a small cluster. The tiny blooms are three-petaled (typical of this genus) bearing somewhat hairy stamens with bright yellow anthers. Flowers appear year round in warm tropical regions, though are open only in the morning and close by early afternoon. Even though flowers are short-lived, a new flower will emerge at the same spot, repeatedly each morning for a week or so until the double-bracts looses steam and dries up. Did you notice this happening… care to share your experience? 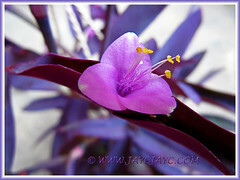 Culture (Care): Tradescantia pallida is a low maintenance succulent that grows easily with the least fuss. Light: Full sun to light shade for best growth, colour and flowering. 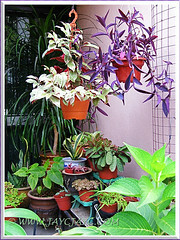 Low light will cause the foliage to turn more greenish and lose its vibrant rich purple colouring. Moisture: Medium water requirements. Water thoroughly, then allow the top 2.5 cm soil to dry out between waterings. Though drought tolerant and may thrive on neglect, best to keep soil well-watered. Soil: Prefers well drained and fertile soils, preferably sandy soil. Others: Feed once monthly with an all purpose, liquid fertilizer that is diluted to half strength. 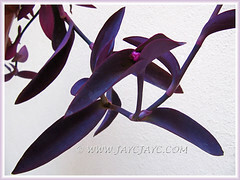 Tradescantia pallida’s stems are fragile and easily breakable, so shelter plants from strong winds. Remove discoloured and withered leaves, plus old spindly stems to keep it tidy. Stems criss-cross and spread vigorously, thus need to be pruned back periodically to maintain shape and promote new, compact growth. Remember not to discard some of the stem cuttings, instead use them to propagate new plants to replace the aged and less attractive ones. Be care when handling as juices from leaves and stems may cause skin irritation in some people. Though it has no serious insect or disease problems, watch out for scales and mealybugs, as well as snails and caterpillars that are attracted to the young shoots. For subtropical and temperate regions: Hardiness: USDA Zone 8 to 11. However, a few Zone 7 gardeners in non-hardy areas have attested at Dave’s Garden that the ‘Purple Heart’ will die back to the ground in winter, but kicks back to life from the roots in spring. An evergreen perennial in tropical and subtropical regions, Tradescantia pallida grows easily as an annual or houseplant in colder climates. If overwintering plants indoor, reduce watering during the winter and put off fertilizing until new growth starts in spring. Flowers from midsummer through fall, and sporadically at other times in warm weather. Propagation: Easily propagated by stem cuttings from any part of the plant. Simply thrust the cutting (10-15 cm long) with a node or two into the moist potting mix and firm it to root or place in water until roots develop, the former method being the easiest and quickest. Frequent propagation from pruned stems is recommended so that you’re always assured of some fresh and attractive specimens to decorate your home and garden. 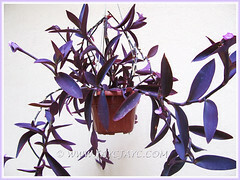 Usage: Tradescantia pallida ‘Purpurea’ will be an excellent candidate in hanging pots/baskets or raised planters with its outstanding purple foliage and trailing stems, draped on the sides…. can be grown indoor as houseplant or outdoors. A versatile ornamental plant that pairs well with any green or variegated foliage plant, even as a complement to other low-growing flowering plants for bold combinations. It’s ideal to be planted as front-of-border groundcover or edging to splash its unique colour to add interest and contrast. Recommended to be used in rock gardens or in other gardening designs. I love this plant too..
the only setback is that they tend to get leggy and invasive. They don’t do so well as hanging plant though. Prefer as ground cover as they form nicely. The other thing is that I usually mix this plant with some other yellow coloured plants – it surely give a dramatic effect in the garden. Thanks for your sharing, James. Our hanging pot has been with us over 5 months and still looking well… thank goodness for that! Will try to propagate some on ground though, just to experiment. Do anyone else purple heart plants attract flies? Is there a particular nurtient that makes green leaves turn purple again?